The K2 Maysis Snowboard Boots are the sweet spot in K2 s lineup, with a medium flex and fine tuned Boa® lacing system that delivers the perfect fit. 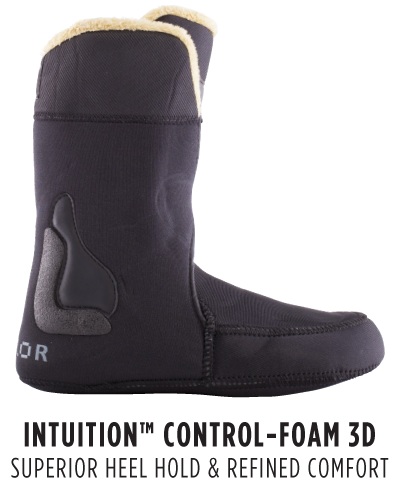 You get proven technology like Intuition™ Control Foam 3D liners and shock absorbing Harshmellow™ soles without the more expensive gadgets, everything you need and nothing you don't. K2 Double Boa® Outer Lacing – The boa dial(s) deliver a micro-adjustable, precision fit. Simply push it in and turn. It offers nearly infinite degrees of tuning, on-the-fly. Boa® Conda Liner Lacing – The patented K2 CONDA System allows you to tighten, loosen or adjust your liner on-the-fly – from outside the boot! The first time you try this, you’ll wonder how you ever rode without it. How it works: Whether attached to a Boa® reel or part of the K2 Conda™ system, the CONDA minimized harness is securely built into the shell of the boot and tightens around the liner to lock your foot in position. Focus is on the superior ankle support and heel hold. The harness lace is threaded through a floating tongue lace guide, allowing riders to customize fit for maximum comfort. Grip Lite w/ Phylon & Harshmellow Outsole – Formulated for long lasting impact absorption and vibration killing, the same Harshmellow material used in boards and bindings can be found in K2 boots. Harshmellow is integrated into the heel and forefoot areas, minimizing rebound and making landings softer and more controlled. Endo™ Construction – Endo construction is based on a urethane endoskeletal structure that focuses boot structure and flex into a single engineered part. The result is a structure that flexes and returns without breaking down when compared to the stitch and glue construction of traditional boots. You get consistent flex and a boot that returns to a neutral riding position quicker and with more energy, which helps you ride longer.